Everything Kills You: that’s your first lesson, soldier. Touch nothing, even if it looks harmless (after the first level, even water will kill you). Dodgeball Rules: don’t worry too much about aiming. Some of your best weapons fire pretty much at the same place no matter where you’re pointing. You’re better off just firing blindly and concentrating on dodging enemies and other dangers (i.e., everything). When you have unruly neighbors there are ways to eliminate the problem. Just ask my aunt. Her recommendations are sensible and solid. The first is to simply speak with the neighbor in a non aggressive or angry way. Likewise do not act passive-aggressively or tell them what they’re doing wrong. Simply explain what you need from them. If you’re lucky, this approach just might work the majority of the time. Our survey found that most prickly issues between neighbors are satisfactorily settled without the matter turning into a legal dispute. Get The Drop: if there’s a level under the one that you’re on, you can (sometimes) drop by pressing down and then jump. Get your fingers to know the difference between “jump then down” and “down then jump”. Weapons: Your default rifle works okay, as long as you keep a shot or two in reserve for those unexpected visitors. Upgrading to the “M” (machine gun) gives you constant fire with unlimited ammo. “R” (rapid-fire) adds to your shot speed every time you pick one up. Grab a few in a row and you won’t have to worry about waiting for your shots to leave the screen. “B” (bulletproof) does just what you’d expect, but pay close attention because you may not realize when you’re vulnerable again. Plus, it doesn’t help for ‘environmental’ deaths (such as falling or getting pushed off screen). For sheer damage capability, the “L” (Laser) is awesome…but with an incredibly thin and short beam that makes quick precise aiming a must (and often not worth the trouble). Also powerful is “F” (fireball), which spirals to cover a lot more screen space. However, it’s so slow…even with an “R” or two under your belt. Rare and almost useless is the Flashing Falcon power-up, which instantly blows up everything on the screen. It sounds good, but there’s never enough enemies to make it truly worthwhile. Less powerful but much more useful is the S (spread) power-up, which gives you five bullets covering a wide angle. Get it whenever possible. We are trying to put as many tips on this page as possible. If you are familiar with any additional tricks or tips please reach out to us. We also always look forward to hearing from any of our readers with questions or feedback. We always try to make ourselves available with in a timely fashion. Thank you. 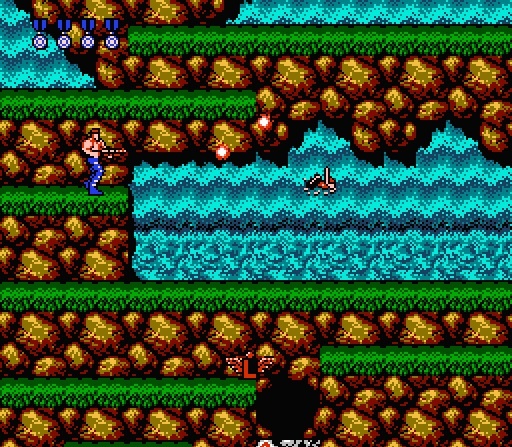 Nintendo 3DS Will Have Contra. Of Course.